Recently, I've been getting into arcade cabinets. 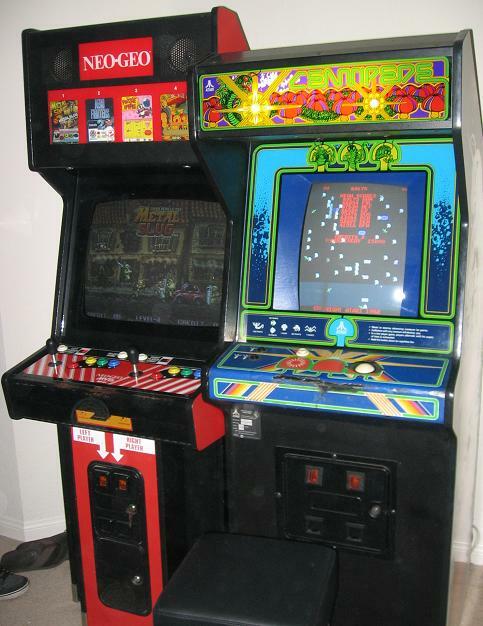 I have two of my own in my living room (a Neo Geo four slot and an original Centipede upright) and am in the market for more as space and money permits. I was talking about my recently acquired Centipede cabinet at work and my coworker mentioned that his fiancée had a Millipede PCB in her living room. I got in contact with her and she said that it was broken and was willing to sell it to me for $10. Considering the simplicity of early arcade boards I jumped on the offer, sure that I could repair the board myself. The first thing to do when I got a hold of it was to plug it into the Centipede cabinet. The PCB had come with a wiring harness that allowed it to plug directly into my Centipede cabinet which saved me the hassle of ordering one online at around $40. I gave the board a once-over to ensure that there were no burned chips or leads and sprayed it with some compressed air to ensure no dust or debris and plugged it in. The following video shows what I got on screen. The important part of the video is the beeps. The screen is just displaying random symbols as it tries to power up and test all of the components. 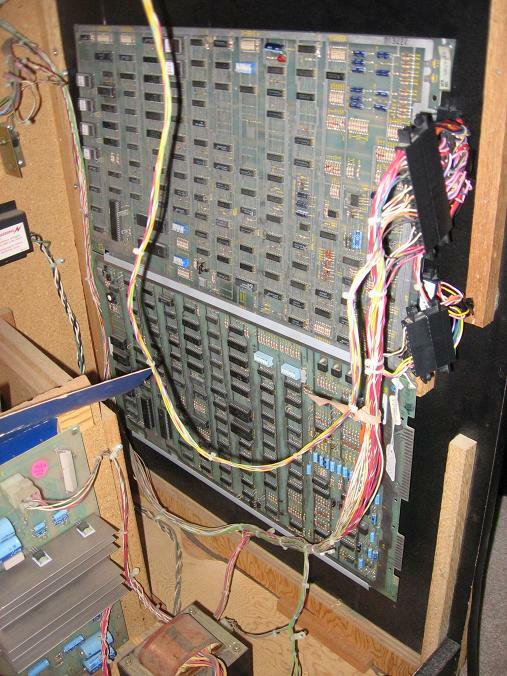 A bit of Google searching revealed that the bad chip was located at 2M (each chip is labeled on the board). A bit more Googling provided the schematic that Atari provided with new PCBs when they were originally sold. The chip corresponded to the play field RAM and was easily located on the board. Curiously, rework had already been done on the board and several broken traces could be seen. So my first task was to verify that all traces were reworked correctly. I spent about two hours with the schematic in hand tracing every pin out from the RAM chip to every other location on the PCB and verified that all of them were good. This left two problems: either the RAM chip itself was bad, or one of the chips it connected to was bad. Since the previous repairman had socketed the chip when he had worked on the board I decided to try replacing the RAM chip first. I ordered a few of the same chip (both Centipede and Millipede use the same chip in multiple places so I figured having some spares around would do no harm) and replaced the suspected faulty chip at 2M. After plugging the board back in, I got partial success! However, the controls would not work. The PCB was probably not set to free play mode, so it was back to Google to retrieve the DIP settings to set the PCB up to the correct mode of operation. 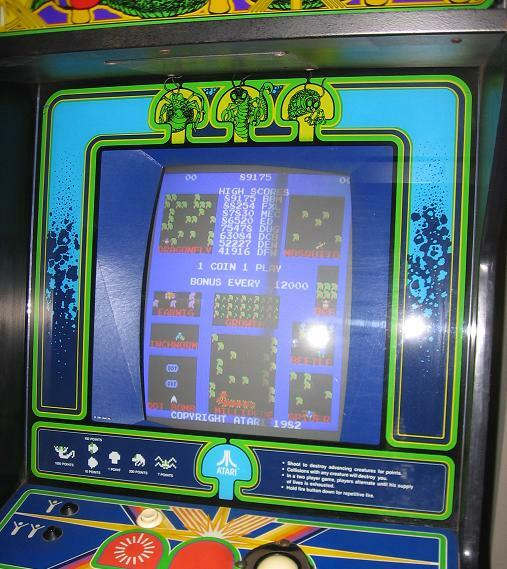 After twiddling with those for a good half hour, the cabinet was then on free play and the buttons started working. However as soon as the game started it was evident that the trackball was not working correctly. Moving the trackball steadily in one direction produced wild motions back and forth, and the player tended towards the upper left of the screen. I moved the wiring back to the Centipede PCB and fired it up to see if I hadn't wrecked the trackball circuit in the process but it worked just fine. I pulled up the schematic again and looked at the trackball input and it was far more complex than simply tracing the RAM, so I fell back to assuming something was wrong with the conversion connectors. They were handmade so it was possible something got switched. After testing every single lead from the Millipede to the Centipede side, I identified two sets of crossed wires: the wires going to the sound board (these made no difference) and the horizontal and vertical position wires from trackball one (for non-cocktail cabinets). I snipped the wires on both pairs and uncrossed them before electrical taping the exposed wires away again and plugged the board back in. Success! I now have a working Millipede PCB for around $50 (original purchase, a cheap multimeter since my other one broke and the RAM chip order). After verifying the functionality by way of a few games, I mounted the PCB above the Centipede PCB and put the cabinet back together again. The Centipede board is left in because I like the idea of having an all-original Centipede cabinet, but I don't know when I'll get bored of millipede. For now, I'm out. Having a cute image complaining about hotlinking is one thing -- it'd be nice to see the images you posted in the first place, even when I'm viewing your blog directly rather than rss reader. Please look into this. Whitelisting my own blog was the first thing I did to ensure the pictures showed up fine. Make sure you are actually visiting from the blog and your browser actually sends the referrer URL. Thanks for your tips very understandable and I've used successfully.